Last year saw significant improvements to this area. March 2017 a Tree Planting Day was held during which a good crowd of local residents and three members of the B&NES Parks Department planted a large number of ‘whips’ (very young trees) in several of the glades that had been created by recent woodland maintenance works. Efforts to stabilise the woodland slopes and to establish replacement trees in place of those that are old or fallen is vital work and needs to be regularly repeated to sustain the health of the woodland. 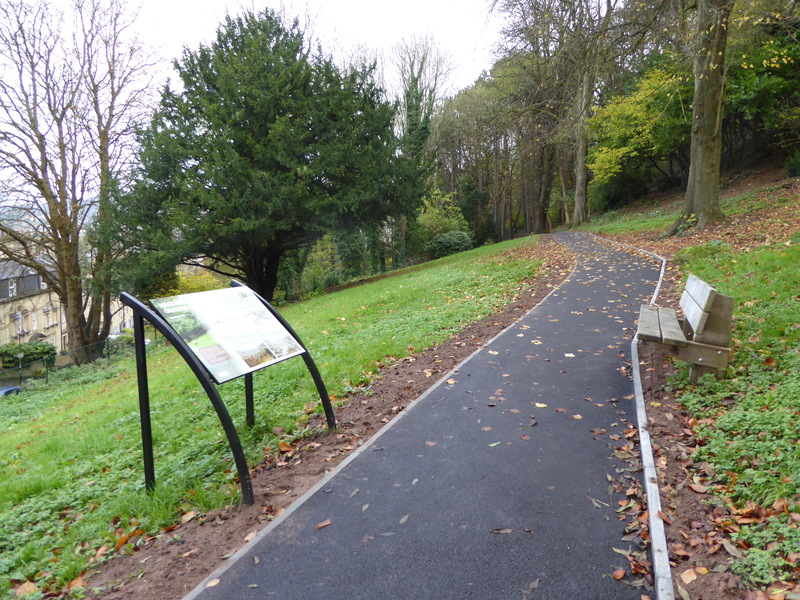 Interpretation panels were installed in the woodland and in Magdalen Gardens, much to the appreciation of local residents and visitors alike. The major improvement has been the re-grading and resurfacing of the footpath through Magdalen Gardens, where walking is far less treacherous in icy weather. This work took several months to complete mainly due to the difficulty in getting mechanical equipment up the narrow steps into the Gardens. This problem will affect all future works in this area. Volunteer work in the Gardens has made steady progress throughout the year, such that all of the large laurels have been reduced (as recommended in the Forest of Avon report), opening up views of the cliff-side and of Bath from the view point above the Gardens. The tangled undergrowth has been cut down and formed into low ‘dead hedges’ that create linear habitats for wildlife. Also, light can now reach the woodland floor so that ground flora will begin to colonise the slope to help stabilize it and make it more attractive. A preliminary phase of shrub planting has been done towards the top of the slope and more is planned to be done this spring. In December about one thousand spring-flowering bulbs were planted on the lower slope and in the grass area – we have yet to see the fruits of our labour. A selection of ferns and shade-tolerant plants will be planted this February on an area previously overwhelmed by laurels. Research into the history of the planning and design of the Gardens was completed by a history student from Bath Spa University, but very few details were found in the Guildhall Archives describing the original layout and planting of the early 1900s; it is assumed that the Gardens served as part of the walk up to Alexandra Park, also providing views across Bath for those unable to get to the top! 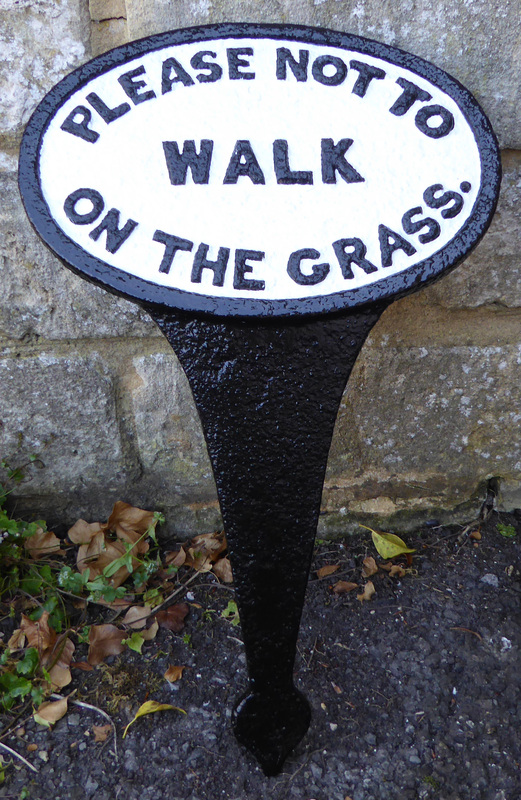 An original cast iron garden sign, unearthed in the undergrowth, was cleaned up and restored for posterity in the Parks Department archive. The Beechen Cliff Steering Committee assessed and agreed to improvements planned by B&NES for the area of Lyncombe Hill Farm: these include works to improve badly worn parts of the footpaths through the fields; works to reinstate hedgerows where trees have died or fallen and where ivy has smothered trees and shrubs; and selected planting of young trees in order to maintain a healthy stock of trees for the future whilst retaining the beautiful views of Claverton Down and across Lyncombe Vale. There has been plenty of wildlife activity in the woodland this autumn: tawny owls have been highly vocal for many weeks; badgers from the woodland setts continue to remind us of their presence by raiding our waste bins; roe deer have been seen on most days, as have our resident buzzards which are regularly joined by visiting ravens from the Abbey cemetery and peregrine falcons from their platform on St John’s spire. Cutbacks in Council funding have understandably had an impact on the scope of works which had previously been hoped for, such that some improvements will have to be shelved while plans to improve all aspects of public safety take precedence. Plans for improving the path through Magdalen Gardens and the main viewpoint in Alexandra Park are still being discussed. A detailed survey of the trees is being carried out which will determine the maintenance and replanting plans for a sustainable future. 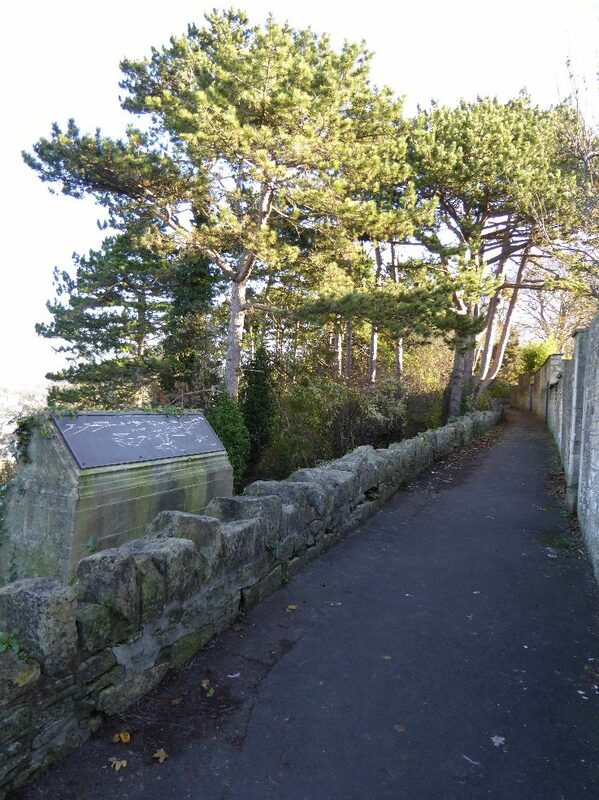 Information panels are to be erected at strategic points which will outline the area’s history and describe what natural features can be enjoyed during a visit. The project to enhance Magdalen Gardens continues slowly. The history of the acquisition of the land by the City Corporation and the planning of the layout of the small park are being researched by a student from the history department of Bath Spa University; his findings will be used as the basis for plans to reinstate the area. Volunteers are gradually clearing some of the previously uncontrolled large shrubs, self-sown sycamore and ash, plus most of the over-vigorous laurel that has for some years blocked the views of Bath that the designers of the Gardens originally intended to provide. Views from the topograph above the gardens have been improved and the adjacent ground cleared of litter and rampant ivy scrambling over the stone walling. The sudden ‘bareness’ of parts of the hillside will soon recover and will allow the replanting of suitable native trees and shrubs, such as hawthorn and rowan, plus the establishment of a more diverse ground cover – all of which should sustain a wide range of wildlife. 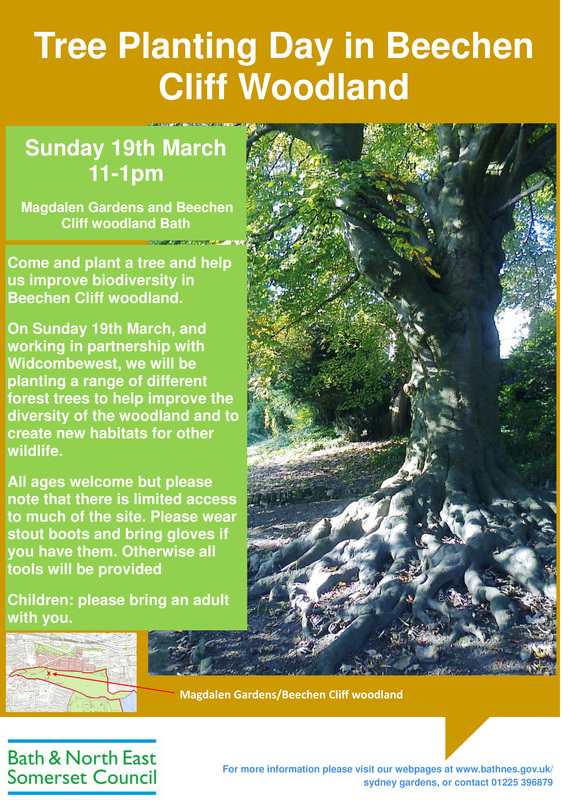 Any widcombewest supporters who would like to help with the work in Magdalen Gardens will be very welcome. Work is usually done on a Thursday afternoon, but that can vary depending on the weather and other commitments. Contact Stewart (sjdat30@gmail.net) if you fancy getting some valuable exercise without paying a gym fee. In 2011 David Beeton began an ambitious campaign to involve the National Trust in the care and long term upkeep of the woodland and fields of Beechen Cliff. Various local groups became interested in his proposal as there was much concern about the neglected state of the woodland. Bath and North East Somerset council eventually committed £500,000 as a contribution to the funding required by the National Trust and a Beechen Cliff Steering Group consisting of representatives from various local groups was established to liaise and consult with Bath and North East Somerset council and the National Trust. Unfortunately, in 2013 the National Trust Central Projects and Acquisitions meeting turned down the proposal so the Steering Group continued to consult with Bath and North East Somerset council to find an alternative solution. 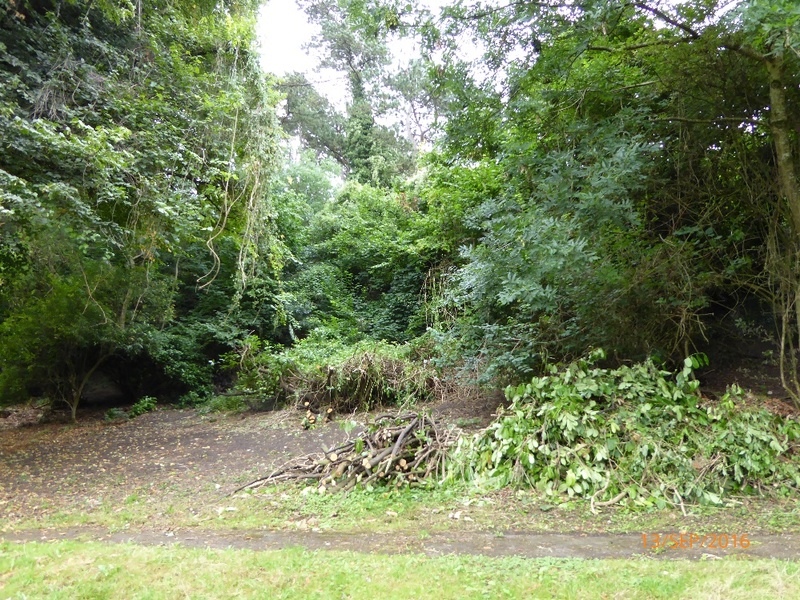 Eventually the council agreed to maintain half of the original sum set aside to be used for essential maintenance works on the woodlands and fields. 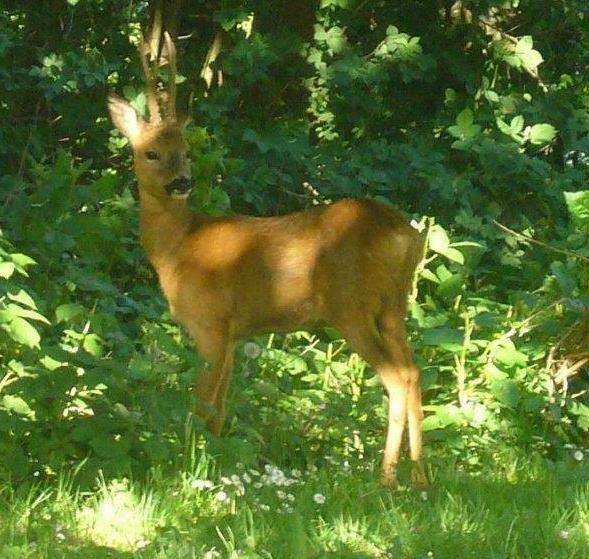 During 2014 Denise Hart commissioned a detailed report concerning the condition of Beechen Cliff woodland from Jon Clark of the Forest of Avon Trust. As a result of this a Draft Woodland Management Plan was produced, presented to the Steering Group and discussed in March. The Steering Group presented the Draft Plan to their organisations for consultation and then fed comments back to Denise Hart. There were then 2 walking meetings in June and July 2014 to look at the plan in detail and to incorporate comments from the groups. This resulted in the final Woodland Management Plan which focuses mainly on conservation of the woodland and the adjacent fields but does include some one-off work. 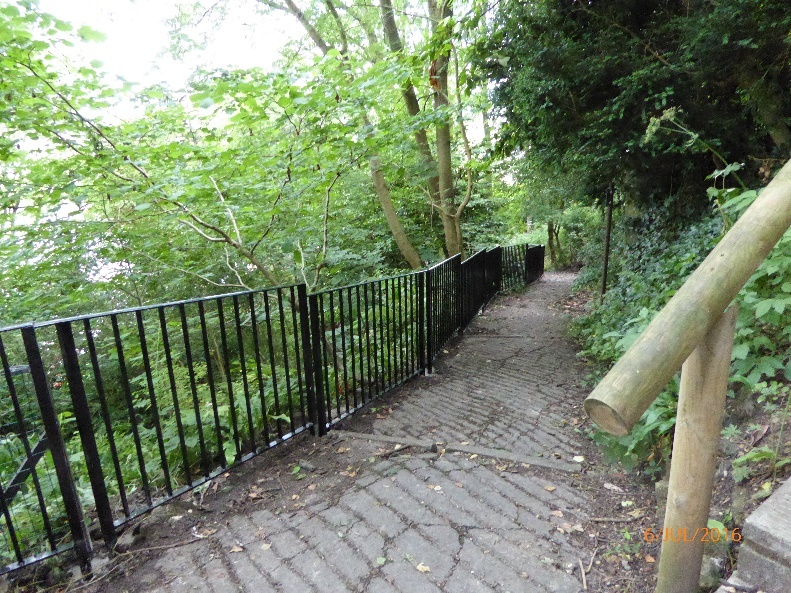 The improvement of the woodland path, first proposed by Paul Osborne when he was chair of the Steering Group, was the first of these works. Work started in December 2014 and was completed in March 2015. The finished path was celebrated by a woodland walk and history talk.